1. A ladder 14m long rests against a wall. If the foot of the ladder is 7m from the wall, then find the angle of elevation. 2. 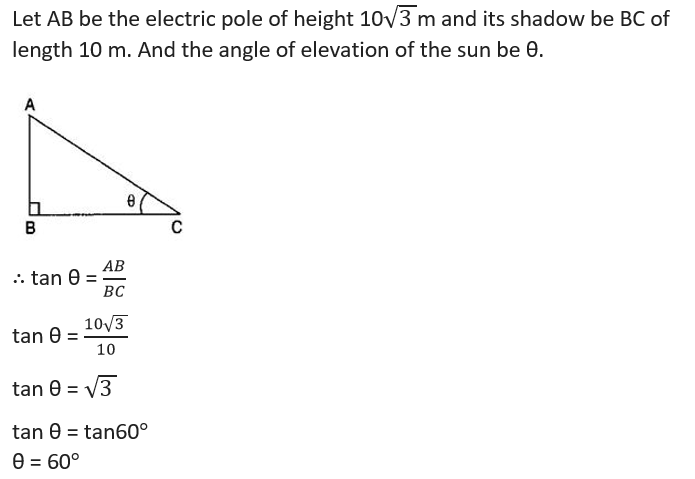 An electric pole is 10√(3 )m high and its shadow is 10m in length, then Find the angle of elevation of the sun. 3. A kite is flying at a height of 60m from the level ground, attached to a string inclined at 30° to the horizontal. Find the length of the string. 4. A circus artist is climbing a 20 m long rope, which is tightly stretched and tied from the top of a vertical pole to the ground. If the angle made by the rope with the ground level is 30°, then find the height of the pole. 5. From a point on the ground which is 15m away from the foot of a tower, the angle of elevation is found to be 60°. Find the height of the tower. 6. From a point P on the level ground, the angle of elevation of the top of a tower is 30°. 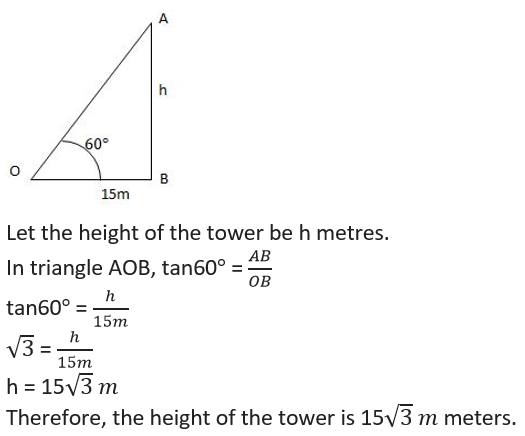 If the tower is 100m high, find the distance between P and the foot of the tower. 7. The ___________ of an object can be determined with the help of trigonometric ratios. 8. The _____________ is the line drawn from the eye of an observer to the point in the object viewed by the observer. 9. The ___________ of an object is the angle formed by the line of sight with the horizontal when the object is above the horizontal level. 10. If the angle of depression of a car from a 100m high tower is 45°, then find the distance of the car from the tower. A ladder 14m long rests against a wall. If the foot of the ladder is 7m from the wall, then find the angle of elevation. An electric pole is 10√3m high and its shadow is 10m in length, then Find the angle of elevation of the sun. 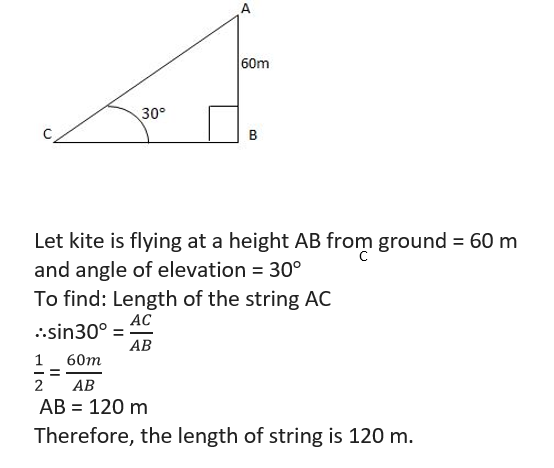 A kite is flying at a height of 60m from the level ground, attached to a string inclined at 30° to the horizontal. Find the length of the string. A circus artist is climbing a 20 m long rope, which is tightly stretched and tied from the top of a vertical pole to the ground. 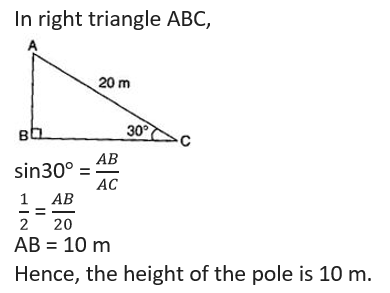 If the angle made by the rope with the ground level is 30°, then find the height of the pole. 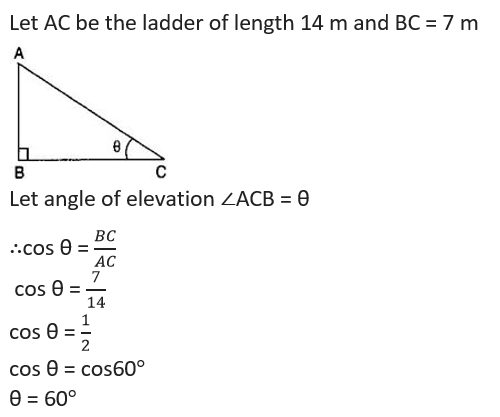 From a point on the ground which is 15m away from the foot of a tower, the angle of elevation is found to be 60. Find the height of the tower. From a point P on the level ground, the angle of elevation of the top of a tower is 30°. 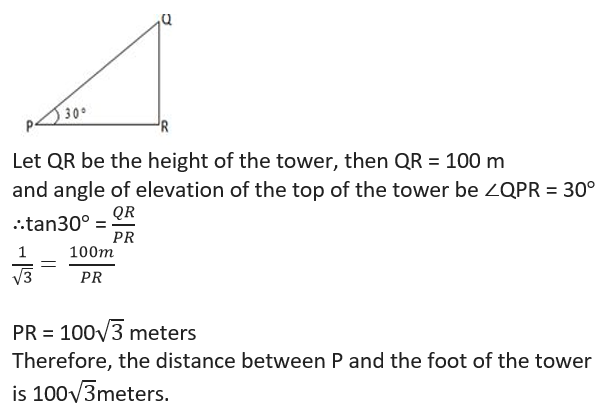 If the tower is 100 m high, find the distance between P and the foot of the tower. The ___________ of an object can be determined with the help of trigonometric ratios. The height of an object can be determined with the help of trigonometric ratios if angle of elevation /depression and one side is known. The _____________ is the line drawn from the eye of an observer to the point in the object viewed by the observer. The line of sight is the imaginary line drawn from the eye of an observer to the point in the object viewed by the observer. The angle between the line of sight and the ground is called angle of elevation. The ___________ of an object is the angle formed by the line of sight with the horizontal when the object is above the horizontal level. The angle of elevation of an object is the angle formed by the line of sight with the horizontal when the object is above the horizontal level. 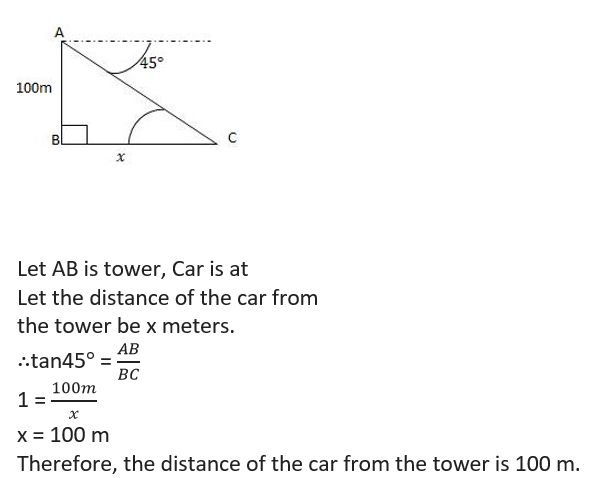 If the angle of depression of a car from a 100 m high tower is 45°, then find the distance of the car from the tower.